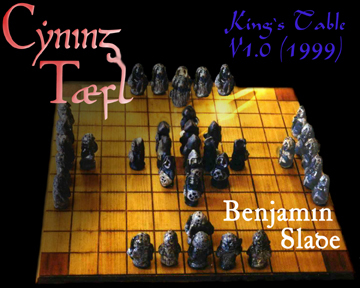 The game known to the Saxons as Cyningtaefl ("King's Table") or simply Tæfl (pronounce to rhyme with 'gavel') is derived from a common Germanic Tafl -game, and this was apparently one of the few board games known to the Saxons prior to the introduction of chess. The common Germanic Tafl is a development of the Roman game latrunculi ('soldiers'). One piece of supporting evidence--beyond the similarities of the games--is that Tæfl (meaning 'table') is derived from the Latin loan word tabula. The game is played on a chequered board, the number of squares in vertical direction being odd and equal to the number of squares in horizontal direction, so that there is a distinct central square (board-sizes include 7×7, 11×11, 13×13, 15×15 and 19×19 squares). The game simulates a battle between two unequal forces, a weaker force in the centre of the board (typically black or dark-coloured), surrounded and outnumbered by an attacking force (typically white or light-coloured) stationed on the perimeter of the board. This description of 'brown maids' sheltering the King and 'fair [men]' attacking matches the traditional dark colouration of the King and his men and the light colour of the other pieces. In the early Middle Ages, when chess was introduced in Scandinavia, it began to replace the indiginious Tafl-games and no sets of written rules or common tradition of playing survived. One of the first persons who became devoted to solving the puzzle of Hnefatafl was Willard Fiske, an American expert on languages (and a chess-players, co-editing the magazine Chess Monthly with legendary American chess player Paul Morphy ). Fiske collected a lot of material that was published in the book Chess in Iceland in 1905, but he finally abandoned the problem as insoluble. The only conclusion he could make was that is was played between two groups of "maids" with a "hnefi" on one side. Hnefi is an Icelandic word and literally means fist, but since the hnefi had a role corresponding to the king in chess it is often translated as "king". The word hnefatafl itself is a compilation of hnefa, genitive of hnefi, and tafl, which is the Old Norse word for board (again, originally borrowed from the Latin word tabula with the same meaning). The game remained a mystery until the British chess historian Harold J. R. Murray connected the description of a Saami ('Laplandish') game, Tablut, in the Linnaeus's diary with the descriptions of Hnefatafl in the Sagas. Murray's hypothesis, that the Saami game of Tablut was identical with Hnefatafl, was put forward in his book History of Chess in 1913. Thirty-nine years later Murray published another book called History of Board Games other than Chess. By that time, much more material that supported his theory had been discovered, notably a Welsh manuscript from 1587 by Robert ap Ifan describing a game called Tawl-Bwrdd. From the material that Murray presented in his second book, it became clear that Tafl -games spread also into Ireland and Wales. Here I present the rules for Cyning Tæfl - my version , the description assuming an 11x11 board (though other sizes would work as well). Pages in the LINKS section present alternative versions. 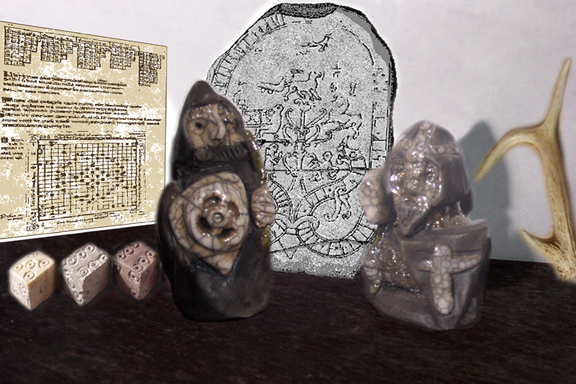 There are 24 White pieces or Tæflstaans (‘tafl-stones’) and 12 Black Tæflstaans, plus a Black Cyningstaan (‘King-stone’). The board is 11x11 squares, with five dark, ‘restricted’ squares, one in the centre and one in each corner. The objective of the Black Defending pieces is for the King to escape to one of the four corner squares of the board. The objective of the White Attackers is to trap Black’s King. All pieces, including the King, move as do Rooks in Chess. That is, they move horizontally along a row or vertically along a column, never diagonally. Pieces may not ‘jump’ over other pieces; the path between their starting point and their destination must be clear. Each player may make one move per turn, consisting of one legal move (as defined above). If a player has no legal moves, the game ends in stale-mate. No piece, except for the King, may occupy any of the dark Restricted squares. Other pieces may cross over the dark Restricted square in the centre of the board, but may not land on it. In order to capture the white piece in the picture above, black would have to move one piece away and then back (or ‘sandwich’ the white Tæflstaan on the other sides), which would require two turns. The same would hold true if it were a White piece which stood next to a dark square and a Black piece moved into a capturing position across from the dark square (i.e. just swap the colours of the Tæflstaans in the above figure and the White piece would be taken). One practical effect of this is that it keeps White from blocking the King’s escape routes. The King (Cyningstaan) cannot participate in capturing 1 ; unless he stands on the centre square, in which case it is still not the King himself who is crucial but rather the dark square he rests upon—White can as easily capture Black pieces against the centre dark square (regardless of whether Black’s King occupies that square or not). The King also cannot be captured in the normal fashion. He must be surrounded on all four fronts (see Victory section below). If a player can make no legal moves, then the match ends in a stale-mate. 1 - In a younger mediaeval version of the Hauksbók riddle, the original Icelandic adjective for "weaponless" is written in singular form, vápnalausan , as opposed the plural form used in Hauksbók . Therefore, it can be argued, the adjective 'weaponless' must be attributed to the King, rather than to the maids, which suggests that the King in hnefatafl is weaponless and therefore cannot take part in captures of enemy pieces. Rigourous testing/playing of the game independently suggests this fact to be true, since otherwise it is much too easy for Black to win. 2 - Some versions of the rules allow Black to win simply by moving to one of the board edges - this too makes it far to easy for any competent player to win by playing Black. Bell, R.C. Board and Table Games from Many Civilizations I. London: Oxford Uni. Press, 1960. Fiske, Willard. Chess in Iceland and Icelandic Literature. Florence, 1905. Gordon, E.V. (ed.) "A Gentleman's Accomplishments." translation by Christie Ward. in An Introduction to Old Norse. 2nd ed., Oxford: Clarendon, 1957 .
ed. Krapp, George Philip and Elliott van Kirk Dobbie. The Exeter Book. Anglo-Saxon Poetic Records, 3. New York: Columbia Uni Press, 1961. Murray, H.J.R. A History of Board-Games Other Than Chess. Oxford: Clarendon Press, 1952. The Poetic Edda. translated by Lee Hollander. Austin: Uni. of Texas Press, 1962. Robinson, J. Armitage. The Times of St. Dunstan. Oxford: Clarendon, 1923. Three Northern Love Stories. translated by Eirikr Magnusson & William Morris. London: Ellis & White, 1875.
rules for playing Tafl on the forum, history, &c.